What suspension block does your Brompton or Flamingo use? If you have not changed the suspension block on the bike before, most likely it will be the stock suspension block with standard hardness. This is good for most people on leisurely rides, where the pedaling is smooth with low torque. However, some people do use their Brompton for fast rides and they do pedal hard in order to go fast. In this case, the standard suspension block may not be suitable for this type of riding. 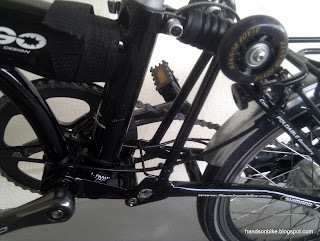 This is because when you push down on the pedals hard with high torque, the chain tension tends to pull the rear triangle forward/upward and compress the suspension block. When this happens, the bike will start bobbing up and down in sync with your pedaling motion. Not only is this motion uncomfortable, it actually saps a lot of your energy by repeatedly compressing the suspension block instead of powering the bike forward. For myself, I have been quite happy with the original suspension block on my Flamingo. Just as an experiment, I got the standard Brompton suspension block and installed it on the Flamingo a few months back. 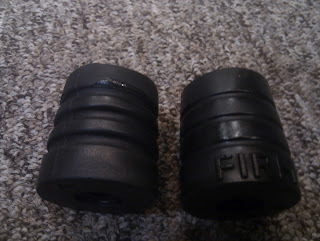 After quite a bit of riding, there does not seem to be any noticeable difference between these two suspension blocks. Both work well, but are also soft enough that bobbing occurs during hard pedaling. My recent riding style on my Flamingo has changed, from a more casual riding style to a slightly more sporty style. I used to only use my Flamingo for mixed mode commuting to work, riding from my house to the MRT, and then riding from the MRT station to my workplace. 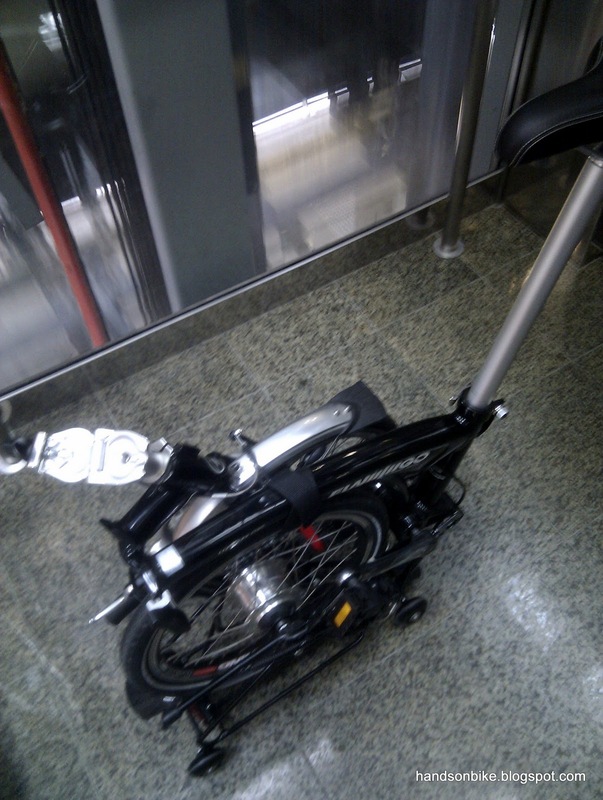 After work, I will ride to the nearest MRT station again and take the MRT home with the bike. This used to work very well, until the MRT timings in the morning changed. The trains used to arrive every 2-3 mins at 630am in the morning, which means that there is no problem for me to get on the train with the bike. However, a couple of months back, the train frequency decreased for some reason, and the wait stretches to 4 mins or more half the time. This means a very crowded train that makes it difficult and inconsiderate for me to squeeze the bike onto the MRT. That was when I decided to just try riding my Flamingo directly to work. It is about 12km one way, and it takes me 40 mins to ride to work, door to door, on my Dahon Boardwalk, including grabbing the newspapers along the way. With the Flamingo, it takes longer even though I have to ride harder, because the Flamingo is not built for speed. To solve the bike bobbing issue, I decided to try out the firm suspension block that is used on the Brompton. 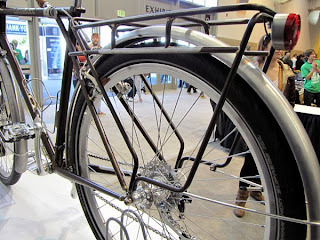 It is said to be designed for use for heavier riders or for riders with a strong pedaling style. Swapping out the block is easy, as I was already using the Brompton standard suspension block. After installing the firm suspension block, I did some riding to test it out by cycling all the way home, riding reasonable hard. I found that there is actually a lot of difference! Not only does the bobbing problem disappear, the bike also feels more rigid overall. When you lay down the power on the pedals, more of the energy goes to driving the bike forward and not to compress the suspension block. I do not have any numerical data to say how much more efficient it is, but the pedaling feeling has been greatly improved. At the same time, the comfort level of the bike has not been affected significantly. Theoretically speaking, the ride should be harsher due to the harder suspension, but it does not feel that way. The ride is still very comfortable, even though the suspension block is now much firmer. This may be due to the fact that I am still using the original Flamingo tires, which has a max PSI rating of 55, giving some degree of suspension. Another reason may be because there was too much suspension in the first place! My initial aim to convert the Flamingo into a sportier ride was to change out the suspension block AND also change the handlebars. The stock M handlebars are a bit too tall for faster riding, with a grip height of 1080mm. For comparison, my Dahon Boardwalk has a grip height of 1000mm on the flat portion, and it is already considered higher than average for a drop bar. To lower the body posture and to reduce the flex on the handlebars, I bought a 60mm riser bar to lower the handlebar height. 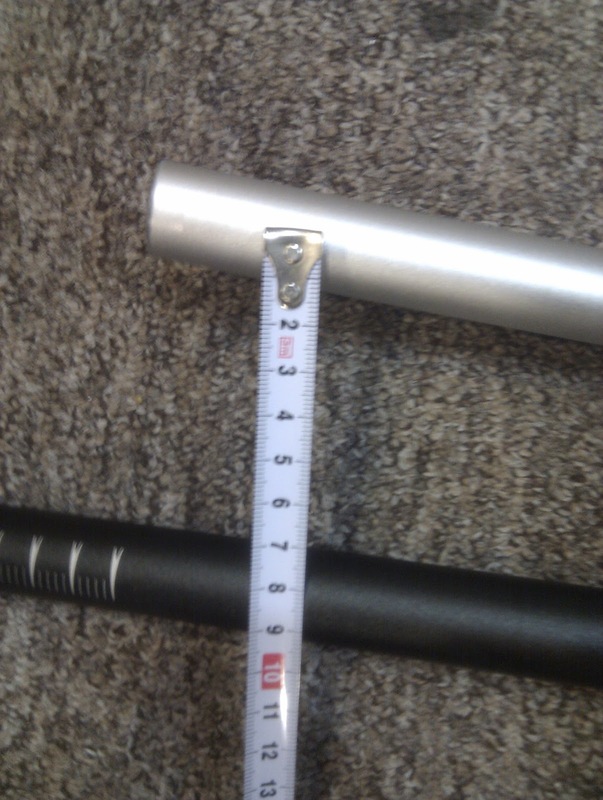 Since it is a MTB handlebar, it is very wide at 680mm, it needed to be cut down to an appropriate width. For comparison, the stock M handlebar has a rise of almost 160mm, and are about 580mm wide. After removing the shifter and brake levers and grips from the handlebar, I took out the M handlebar from the handlepost clamp. This is actually quite difficult due to the bends in the handlebar. I managed to hold the clamps open by using a bolt to help push open the clamp and hold it open, while I wriggled out the handlebar. 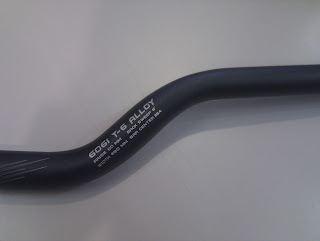 Upon inserting the new MTB handlebar, I realized that there was a big problem! The handlebar can’t fit in the C shaped clamp. Only upon closer inspection I found that the reason the original handlebars could fit, was that only the handlebar centre clamp area is 25.4mm diameter, the rest of the handlebar is a smaller 22.2mm diameter. This was how the bends of the handlebar can be wriggled through the clamp. 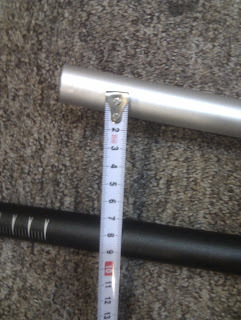 But for this new MTB riser bar, the diameter starts to increase from 22.2mm to 25.4mm at the bends, making it impossible to squeeze it through the clamp. 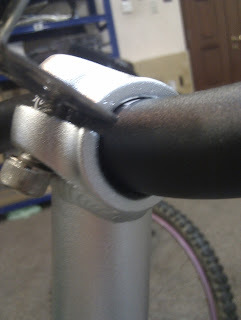 The increased diameter together with the bends means that the clamp would probably have to be at least 30mm wide in order to put the handlebar through. 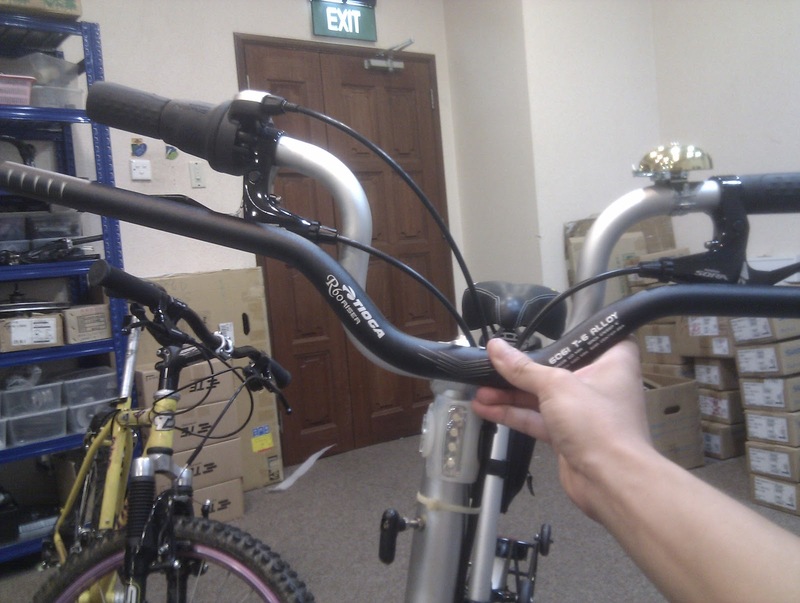 This was something that I overlooked when I bought the new handlebar. There is no way the clamp can be opened this wide without breaking it. The only consolation for this error is that the new MTB riser handlebar is a relatively cheap one. The riser bar cannot fit through the clamp! A straight handlebar will work, but it will be too low for comfort. 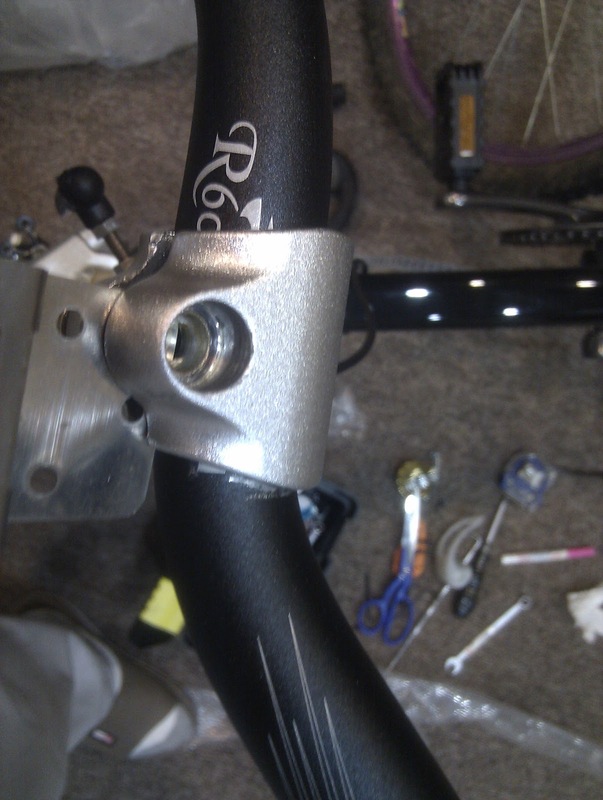 The only way a riser bar will work is if the handlebar is narrow all the way, and only widens to 25.4mm at the middle clamp area. Otherwise, if the diameter at the bends are more than 22.2mm, it will not fit. So, the only change that was made to the Flamingo is the new firm suspension block. I’m really happy with the firm suspension block, as it enables more efficient pedaling without energy loss, while at the same time the comfort level is hardly reduced! thanks for the suggestion. after looking at the Flamingo, it might just work! 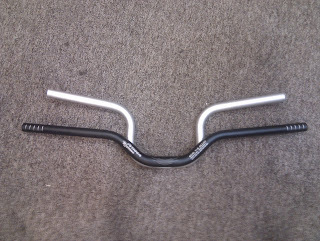 look for NS district riser bar, more than 3" rise. Where to buy flamingo london, merc etc? Hi from Spain, Steve. 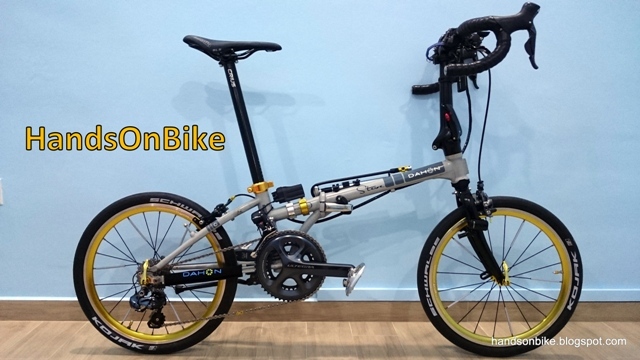 Do you think you can settle into the Flamingo closure of the Brompton rear frame? The closing system of the Flamingo is not very good. 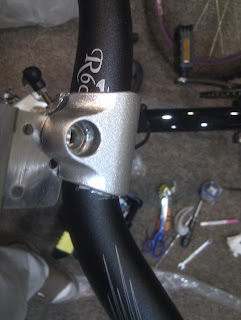 I have bought the Brompton rear clip parts and tried to install it on the Flamingo, but I did not succeed. the frame clamp area is different, and even with some machining the clip could not close properly.